FABTECH, Mexico’s leading metal forming, fabricating, welding, and finishing event was held in Mexico City, from May 2 to 4, 2018, at the Centro Banamex. The ITA office in Mexico City and Machines Italia organized a “Punto ITALIA” desk at the event to provide information and assistance to local visitors,connecting them with Italian exhibitors and delegates. The presence of Machines Italia served to underline the importance of the ITA’s Technological Centers network and its role in supporting the Mexican manufacturing industry: in particular, the Center for Italian-Mexican Innovation In The Production Of High Technology For Foundry And Metal Works (CIIMMATH), which has been training technicians and conducting high level R&D in partnership with local companies and universities for over a decade. 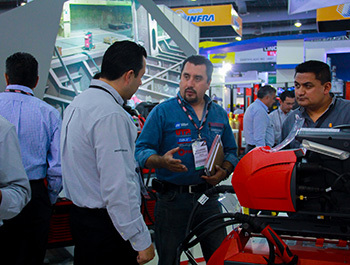 The next edition of FABTECH will take place in Monterrey, Nuevo León, Mexico, from May 7 to 9, 2019.